Congratulations Chrissy & Ryan! Ryan proposed to Chrissy on Marco Island beach. 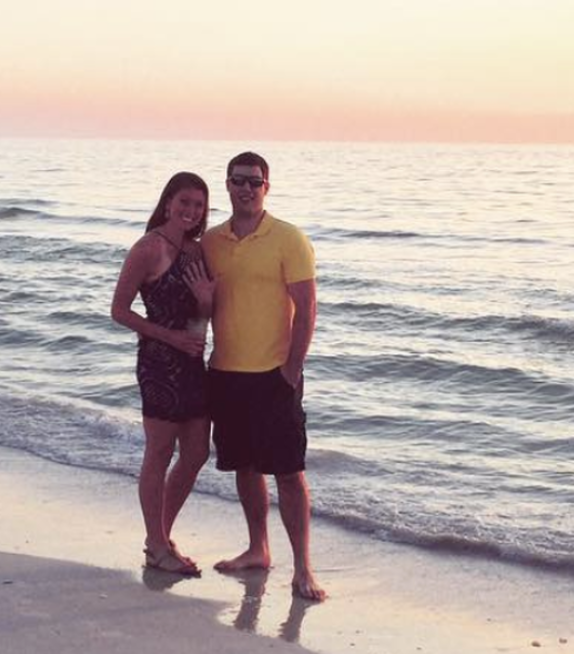 Ryan and Chrissy took romantic walk on the beach, and he popped the question while watching a beautiful sunset! We had met when we were little, but didn't start dating until 2012. We were actually in the same first grade class and had played on the same soccer team. Over the years we had lost touch. We didn't start officially dating until January 2012. We had went for a walk on the beach at Marco Island. We were just watching the sunset, and I told Ryan this would be a perfect moment for a proposal... And after I said it, he then pulled out the ring! I love my ring so much! The ring is a white gold, with a platinum head, solitaire setting with a 1.25 ct round diamond. Thank you so much for the most beautiful piece of jewelry that a girl could ask for! Ryan was very happy with his experience! Steve Manascalco sold the jewelry and helped him pick the PERFECT ring! Thank you Chrissy & Ryan for sharing your beautiful story with us!